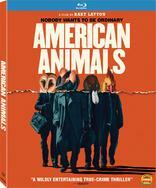 American Animals is the unbelievable but entirely true story of four young men who attempt one of the most audacious art heists in U.S. history. Determined to escape their predictable suburban lives, Spencer and Warren decide to do something extraordinary: steal some of the world's most valuable books from a college library. Enlisting two other friends, Spencer and Warren meticulously plot the theft — but their caper takes on a wild life of its own in this thrilling film from writer-director Bart Layton (The Imposter).